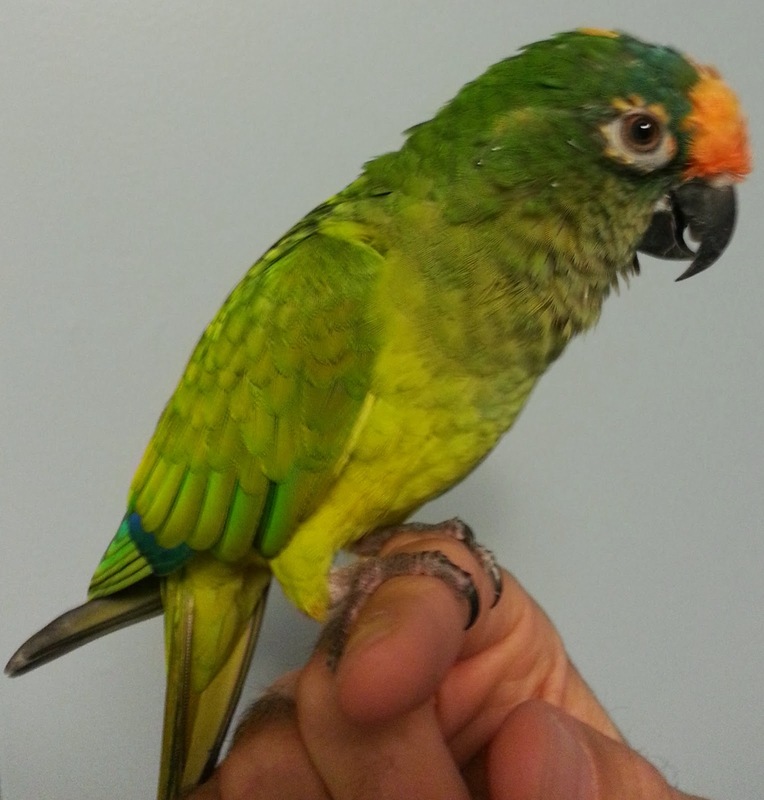 Edgar is an unsexed Peach front Conure parrot of unknown age currently living in Seattle in a home with a Senegal parrot and a couple of children. He would prefer to be in a home without children. Children make Edgar very anxious. 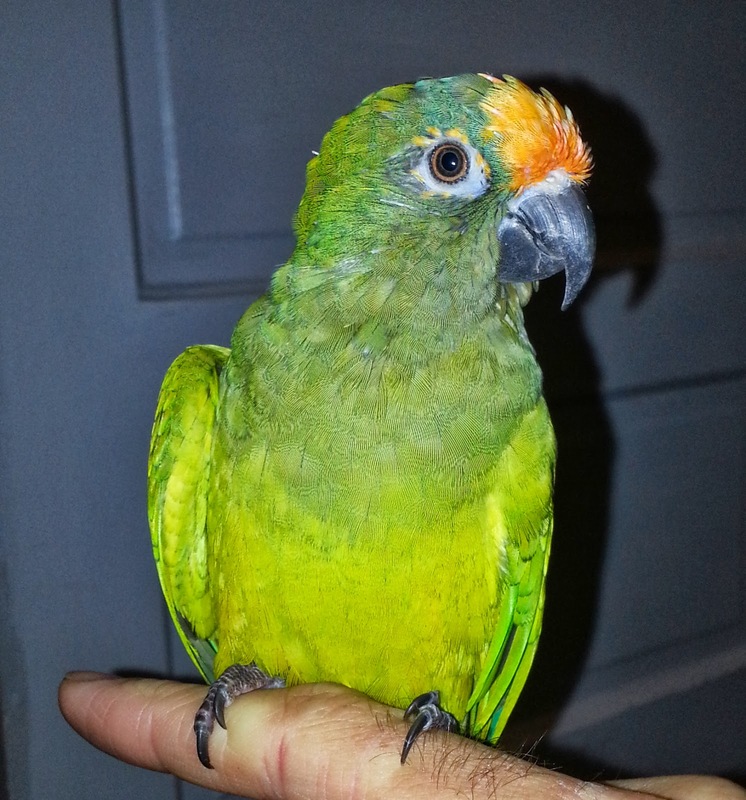 Edgar is a Peach front Conure who has been with me since 1999. I adopted him and don’t know how old he was when he came to me but guess that he was no older than 2. He hasn’t been sexed, so he could be a she. He lives in a house with a Senegal parrot in a separate cage, two adults and two small children. He is very social and loves attention from anybody, but is also a bit fidgety and aggressive towards new people or small children. Experienced bird handlers (our boarder and vet) have no problem with him and always comment on how friendly and funny he is. He is very active, loves to climb, hang and burrow. He won’t perch for very long on your shoulder before exploring and trying to climb inside your clothes. His wings are currently not clipped but he prefers to climb or walk everywhere. He will climb down a cage, walk across the floor and climb up another one instead of fly. So his wings could be clipped without issue. He says “Hello” and “Up” and mimics laughter. He has always enjoyed a love / hate relationship with our other parrot. They love to chat as long as there is distance between them. Edgar loves to rub up against your open hand but is difficult to preen because he’s so fidgety. I think constant handling will help cure that. I’m the only one in our house that handles him and am gone most of the day, so my hope is to find him a home where he receives the attention and enrichment that he deserves on a more consistent basis. Edgar is Free to the Right Home. If you are interested in adopting Edgar please read the Northwest Parrots Fund Adoption Procedures page and contact Northwest Parrots Fund.